What Temperatures Do Lighters Burn At? Pocket lighters ignite butane or naphthalene fuel with flint and steel to produce a small flame. Both fuels have a standard temperature range, but the actual temperature of their flames varies with the length of time the lighter is on and with the ambient temperature, oxygen content, and movement of the surrounding air. Disposable butane lighters can be found commonly, but many people also use refillable naphthalene wick lighters. Disposable butane lighters could potentially produce flames as hot as 4,074 degrees Fahrenheit, while their naphthalene counterparts could reach 4,591 degrees. However, factors like air movement and ambient temperature generally limit this. Disposable butane lighters ignite at a temperature of 77 degrees Fahrenheit. If a butane lighter did not lose any heat — called the adiabatic temperature — it could reach 4,074 degrees, but most butane flames actually burn at temperatures closer to 3,578 degrees due to their interaction with the surrounding environment. Because oxygen is necessary for combustion, flame temperature varies with altitude, air movement, and atmospheric pressure. Flames constantly lose heat to the surrounding air, and flames in cold environments burn at lower temperatures than they would in hot environments. Flames surrounded by cool, moving air lose heat even faster, as the air moves the wick's heat away to be replaced by more cold air. Lighters find use in many activities. Cigarette-smokers often carry them, as do campers and chefs who use some types of barbeques. 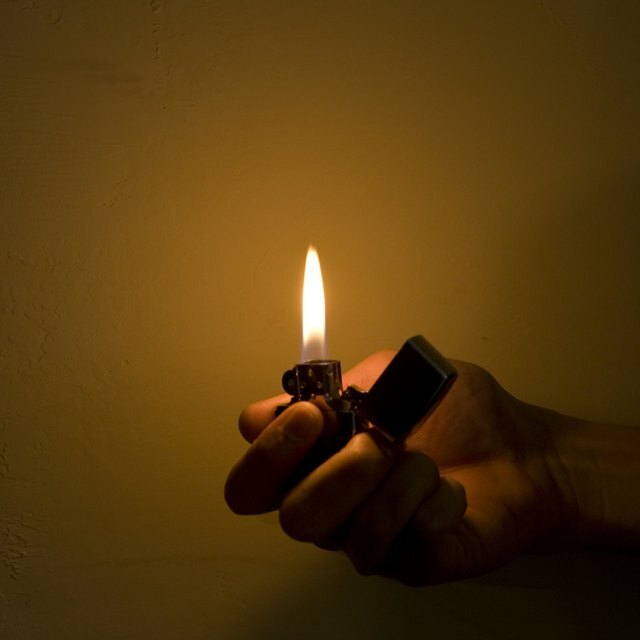 Similarly, lighters find use in most homes for igniting candle wicks. However, people should use caution when handling lighters, as human skin can burn at temperatures as low as 109.4 degrees Fahrenheit if the heat is applied for long periods of time, not that many would test this theory on themselves. Similarly, lighters should be kept out of the hands of children. Media outlets occasionally report homes burnt down because children played with lighters. Libal, Angela. "What Temperatures Do Lighters Burn At?" Sciencing, https://sciencing.com/temperatures-do-lighters-burn-8475271.html. 27 April 2018.